It was time to take a trip down the rabbit hole to see if I could find some answers. The driving time is just for reference. I’m guessing the family moved around via train, and if I’m ever able to find historical train line information for those areas, I’ll update this post with that data. Wojciech Knap (b. 1865 in Dolega) and Barbara Witek (b. 1867) likely married in 1892 in/around Garki. 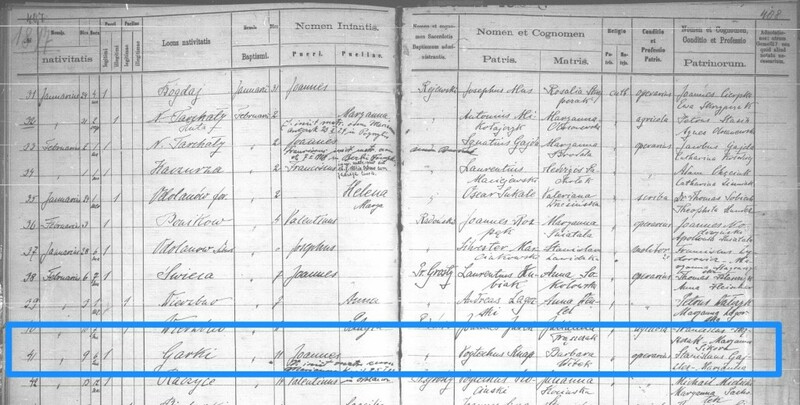 While I have not yet found their marriage record (it will be in German, and painstakingly trying to decipher even 1 legible letter within German handwriting is not my idea of a good time) the rule of thumb back then was that the couple married in the bride’s parish. That is often also where the first child is born. 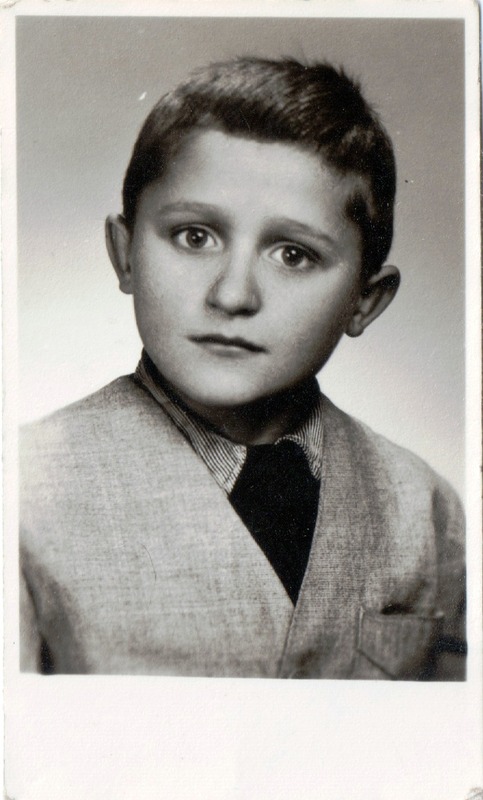 I have Wojciech’s birth record from Dolega and 2 records that reference that Barbara was from Garki. In addition, the records do not show any other Witek’s in Dolega, nor were there any other Knap’s in Garki during the couple’s child bearing years. Considering the distance between their villages, I’d love to know how they met each other. Unfortunately you’ll need to remember that we’re still in the rabbit hole, where every 1 answer found will create numerous new questions, many for which we may never find an answer. But that won’t stop me from trying. At this point in 1907, Barbara still had family living in Garki, as Wojciech did in Dolega. With Garki being in the German-controlled area of Poland, and Dolega being under Austro-Hungarian rule, there are a few theories as to why they chose to move, but of course I wish I knew for sure. As far as I can tell, between 1907 until around 1911 the family stayed in Dolega, and it was business as usual. 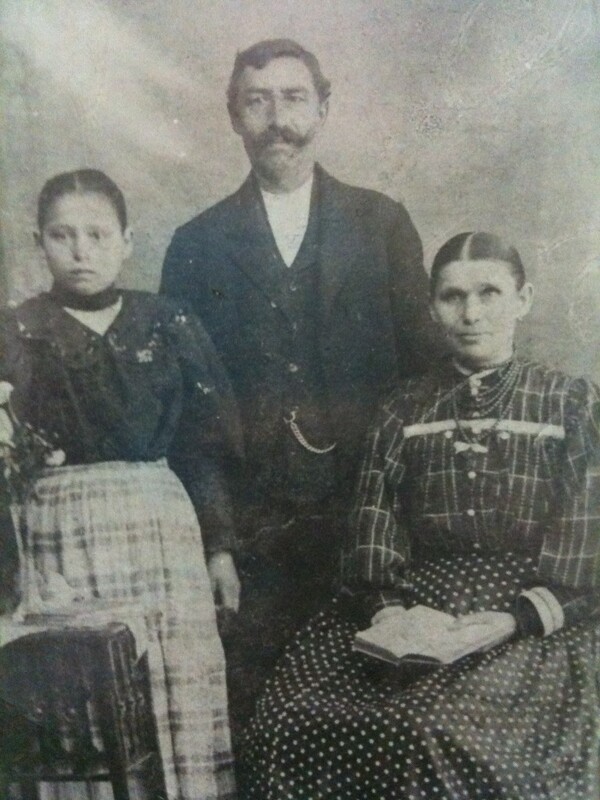 Birth records show that Wojciech worked as a laborer/hired hand, and that likely did not change much with their move. If I know my history well enough, during that time period Wojciech and Barbara would still have been considered peasants, and Barbara would have been expected to work just as hard as her husband. However, despite the absence of documented proof, I’m led to believe that while they might not have been rich, they appeared to have more money that one would expect a laborer/hired hand to have. In 1912 at the age of 16, Julia immigrated to the United States (Chicago). Her passenger list shows a couple of interesting things. First, she is coming to the U.S. with $36. The inflation calculator at the Bureau of Labor Statistics only goes back to 1913, however $36 in 1913 had the same buying power as $862.22 today. This was during a time when plenty of people listed on passenger manifests were only traveling with $5-$10. Second, Her last permanent residence is listed as Reupzig, Germany, which is also where her father is shown to be living. Wojciech and Barbara did not just stay in a local hotel while seeing their daughter off to her new life in the U.S. 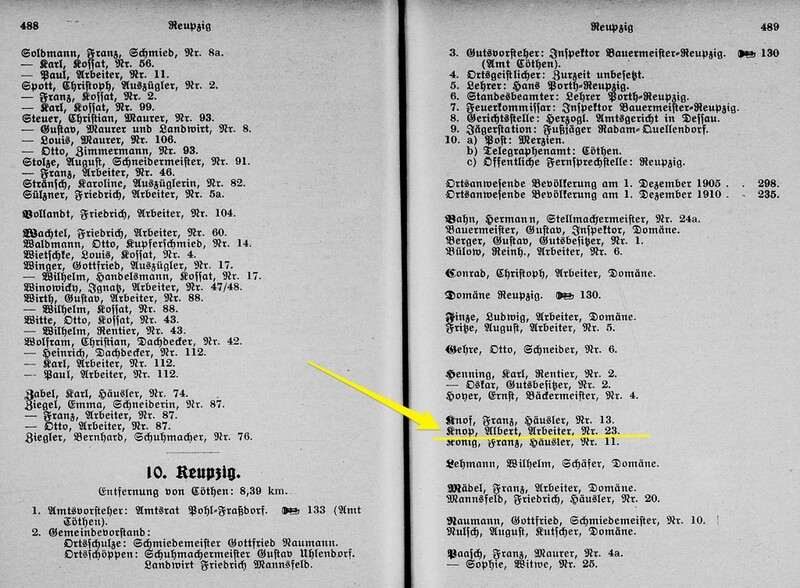 They actually lived in Reupzig for a period of time – thankfully long enough to appear in the 1912-1913 Kothen Adressbuch. Is the girl in the photograph Julia, or Martha? Personally, I am 100% convinced it is one or the other, because other pictures I have of them both as young women compliment this one perfectly. At least when they were young, Martha and Julia looked very much alike. If it is Julia in the picture with her parents before she immigrates, that would make the most sense. But either way – where are the rest of the siblings?!? When Julia leaves, Jan is 15, Martha is 13, Sylwester is 11, Monika is 8, and Zofia is 5. It’s possible that Julia wanted a keepsake of herself with her parents, and the siblings would have been included if they traveled with the parents. But honestly, I don’t know if I’ll ever be able to find out where the rest of the kids were. The next city directory for the Kothen area that I could find was for 1916-1917, and Wojciech is not listed. So it’s safe to assume that after Julia set sail, Wojciech and Barbara went back home (likely before WW1 began in 1914). For the next 10 years, Martha and Julia are separated in two different worlds. While in Chicago, Julia meets Frank Smuszkiewicz (a recent widower) and in January 1917 they marry. Helping to raise 4 children from his first marriage, she gives birth to her first child (Frances) in October of 1917. In December of 1918 Barbara (nee Witek) Knap dies in Dolega. Julia has 2 more children in 1919 (Lottie) and 1921 (Sophie) before her and her sister Martha meet in person again in September of 1922. Arrangements were made for Julia’s husband Frank to be the point person to meet Martha in New York, so it’s safe to assume that Julia kept in touch with someone in her family, if not Martha directly, in order to have helped with these arrangements. I would LOVE to know what Martha did with herself in the 6 years after she arrived here, before she married John Jucha. I do know that within those 6 years Julia had 3 more children (Frank – 1924, Victoria – 1926, Esther – 1928). But between 1922 and 1928 something strange must have happened. In November 1928 Martha and John wed, yet in the photograph of their wedding party, it’s clear that neither Julia or Frank stood up in the wedding. But why not? There’s nothing to suggest that any of their other siblings ever came to the U.S. Quite the opposite, actually. My thinking is that brother Jan somehow ended up back in the Garki area, in Odolanow (which was the parish that served Garki, among other villages). 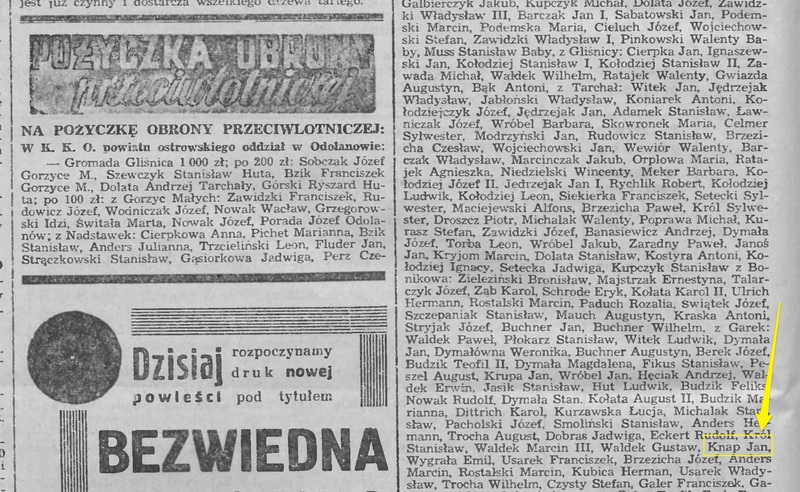 This newspaper from May 1939 lists the names of local people who (if my Polish translations are correct) donated money to a defense fund. 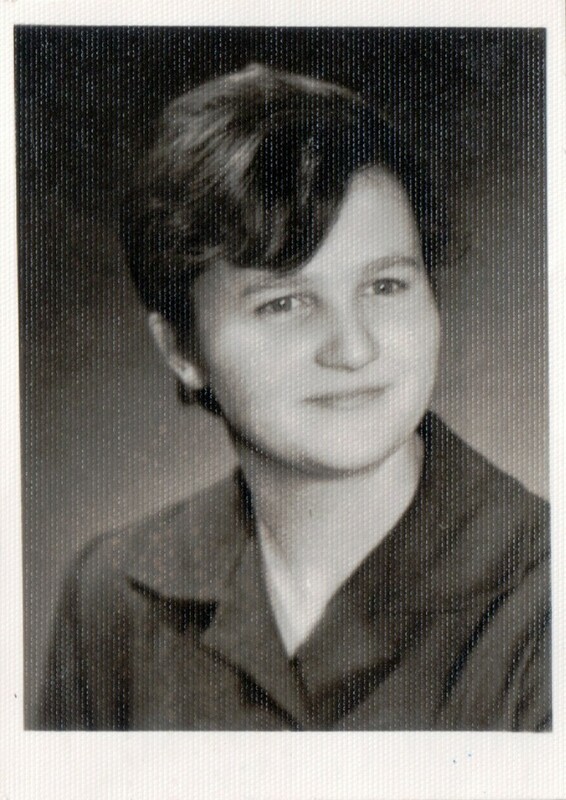 Jan Knap (the ONLY Knap mentioned in this, and throughout numerous other editions of the local paper) donated 20 zlotys. But what lends more credibility to this possibility is that Martha had at least one niece and nephew who were writing to her, sending photographs, and who addressed her as their aunt! These are pictures of Roman and Wiktorya Knap, from Granowiec, just a hop, skip, and jump away from Garki. Either way, Martha was corresponding with Knap relatives from the area in which she was born. But back to the timeline, in November 1928 Martha marries John Jucha and the identities of most in the wedding party are a mystery. According to the birth records for Zofia’s children, none of her Knap siblings were godparents. And concerning any children born to Julia or Martha from 1922 on, the baptism records are not yet available to see if either sister was a godparent. Both Julia and Martha had daughters that stood up to each other’s weddings, so why are there no memories or pictures of the families getting together? I have proof that Martha corresponded with some of the relatives that stayed in Poland, but not one single picture of Martha and Julia together. 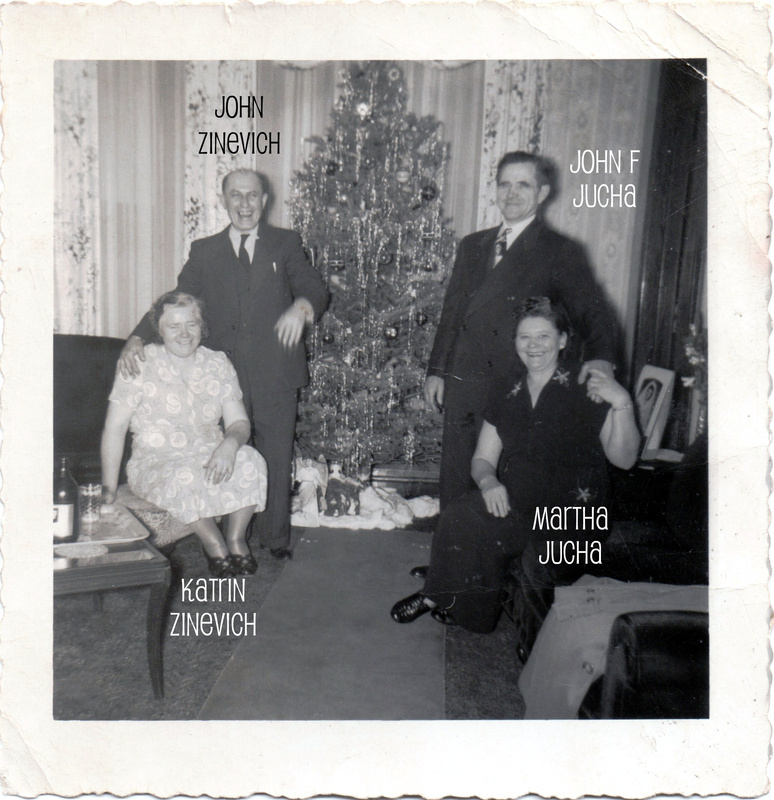 🙁 I even have photographs of Martha & John with Katarzyna (nee Miechowicka), a friend from a village near Dolega, and her husband John Zinevich. Does a photo exist with Martha & Julia together? What happened to Jan, Sylwester, and Monika Knap?